Breaking the fourth wall a bit, the RAAL-requisite SR1a was actually the first thing I heard at the show. I met with Sean Thong of SLT Technologies, who’s been a massive supporter of mine, which I very much appreciate. I’d been anticipating the SR1a demo for quite some time, especially given the rave reviews it’s been receiving online. 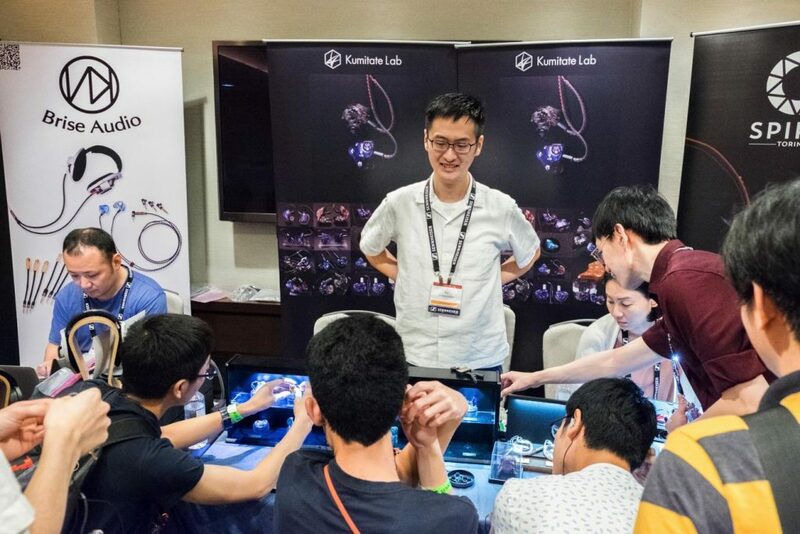 And, what I experienced was one of the most unique – in good ways or otherwise – sessions I had throughout the entirety of CanJam SG 2019. First comes the wearing experience. The headphone suspends along the top and sides of the head, with the ear cups hanging beside the ear. So, clamping force in the traditional sense in not there; it’s present more so along the temple more so than the ear. Sean guided me through two possible configurations. One had the front edge of the ear cups touching the ear. The other had them fully open, which sacrificed the already-minimal isolation the first configuration offered for a wider, more open stage. Given the conditions of the show, I opted to stick with the first configuration. In terms of comfort, I felt the SR1a fared well. I was more concerned about security. They held no grip whatsoever with the sides of the head, so movement of the head or neck would cause the headphones to every-so-slightly swing. 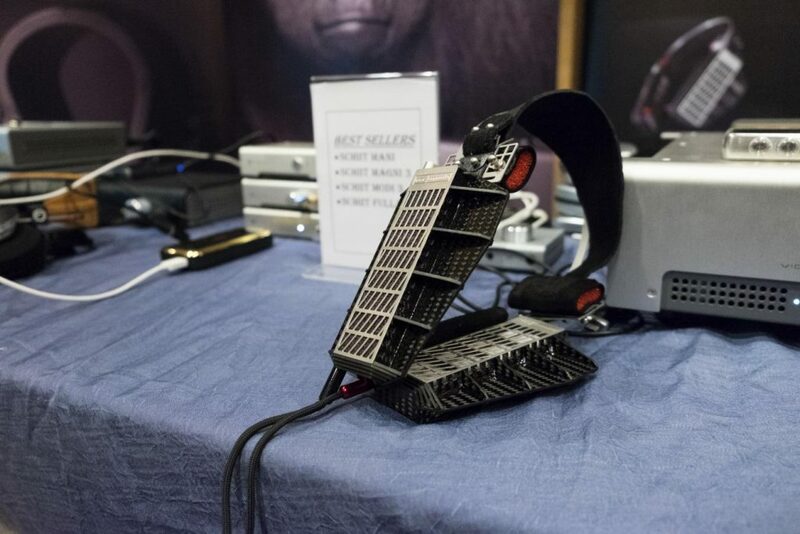 My listening was slightly hampered by paranoia that I’d swing $3500 ribbon headphones off of my head – especially when listening to more upbeat genres of music – but thankfully, that never occurred. 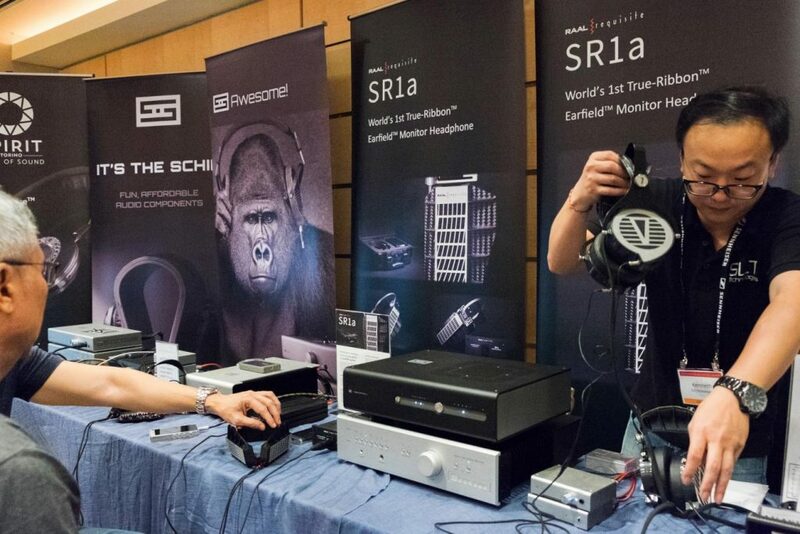 The SR1a also had to be driven off of a special impedance box, which seemed to only accept speaker taps, so that’s worth noting for any potential purchaser. RAAL-requisite SR1a: The SR1A presents an engaging, spacious, upper-mid forward sound, bolstered by a well-bodied, open and agile treble. The stage is well-defined, open and richly layered, but it plays second fiddle to the instruments that live within it. They possess a vibrant, saturated presence. Electric guitars and horns demand attention. Pianos have a hint of reediness to them. But, they sound open and airy as well. There’s not an egregious fullness along the upper-mids. And, the extremes line up with it linearly too. It emulates the sound of near-fields, reminiscent of my Avantone’s. Truly, I was most impressed by the SR1a’s bass performance. Despite the lack of a seal, the headphones delivered a meaty, full-bodied and well-extended low-end. At the same time, it also possessed excellent clarity and agility in order to maintain the cleanliness of the stage. Bass notes were highly resolved and sufficiently warm, but the same can be said for the rest of the SR1a’s frequency response, really. Airiness, openness and quickness are juxtaposed against naturally-hued and full-bodied instruments. 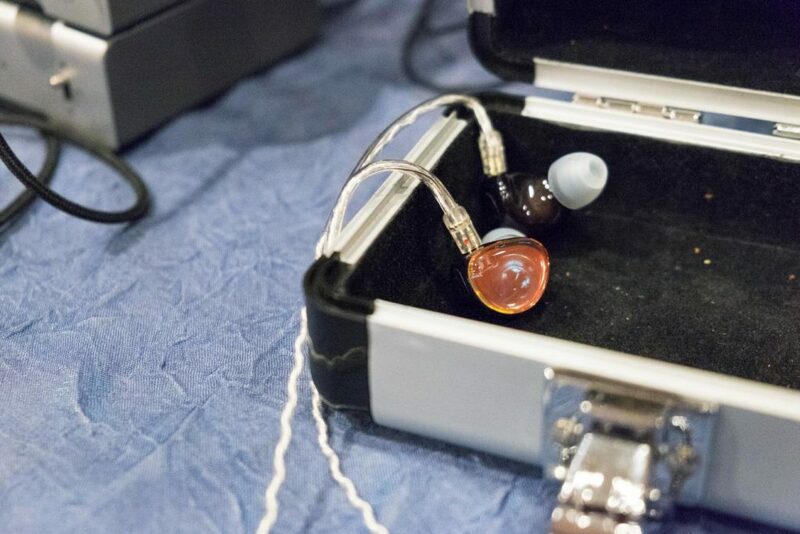 So, almost in a similar fashion as the FiR Audio IEMs, you get the best of both worlds between timbre and transparency. Though, it’s the upper-midrange that’s biased here, rather than the lower-mids there. Tone is on the neutral side due to a brighter low-treble, but there’s definitely enough balance here for professional work. Imaging precision is great, yet unexaggerated. There isn’t a forcefully operatic sense to its staging, yet stereo separation is high, the diagonals are strong, and resolution all-around is impressive. What’s most captivating is how effortlessly the stage is stably maintained. The authority the SR1a has over the entire response is uncanny. The ribbons also add speed that heavily contributes towards dynamic range. As the track builds in energy, the SR1a conveys that drama skilfully. Overall, the SR1a is as impressive as it is unique. I’d definitely love to revisit it in the future in a non-show environment. The next booth I visited under the SLT Technologies umbrella was Rhapsodio. My previous experience with them was reviewing their flagship Eden. 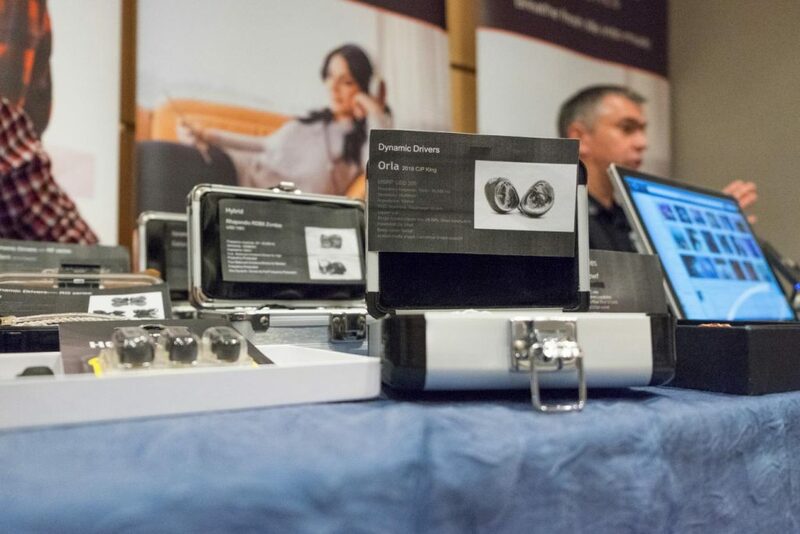 I was delighted to find them as I’d been wanting to demo their all-new Orla and Iris IEMs for quite some time. 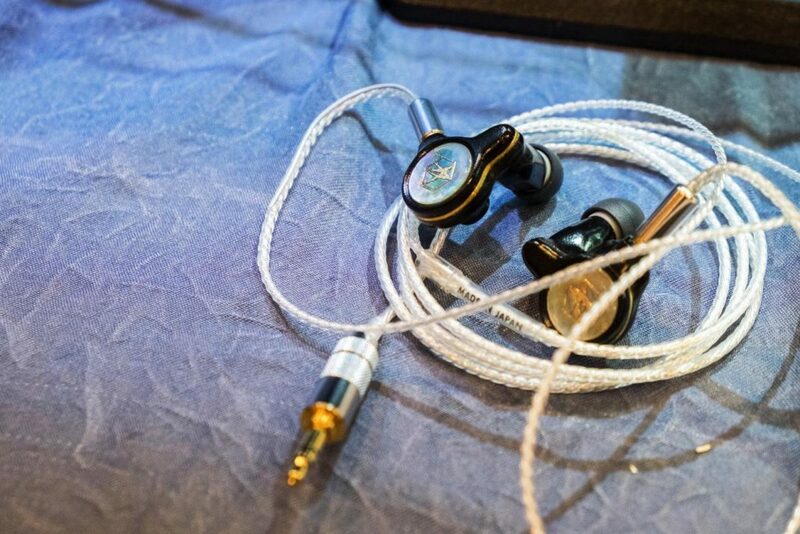 To my surprise, they were relatively affordable IEMs at 300 and 200 USD, respectively. I only found this out after listening to them, and it only made my impressive, impressive listening experience all the more sweeter. Rhapsodio Orla: The Orla possesses a gorgeous tonal balance to my ears. It’s lightly warm, then undercut by a crystal-clear top-end. Listening to Michael Bublé’s rendition of Fever, the emotionality of the piece really comes through; the drama of the horns, the ease of the drums. All of it translates through timbre, which is an impressive feat. Articulation, clarity and detail retrieval are well done as well. The top-end possesses an accurate timbre with just the right amount of body, speed and refinement; crisp, yet likeable and forgiving. It’s neutral in tone too, as to not brighten the background. The stage is open and airy, but instruments are on the larger side. The resulting image is emotionally engrossing, but neither claustrophobic nor inside-the-head. In terms of translating dynamic range and the ebb-and-flow of music, I think the Orla performs better with jazz and classical than it does with rock or pop, for example. This is because its sub-bass – though extended – doesn’t necessarily add that much visceral-ness to the proceedings. Those large instruments start filling up the stage with the latter kinds of recordings as well. Truly, this is a piece where midrange dynamics shine, and a wonderful, wonderful gem for fans of jazz and classical music without sacrificing low-end content or value-for-money. Rhapsodio Iris: The Iris is more of an all-rounder with a more present bass response and a laid-back upper-midrange. Treble bite has been pulled back a hair for a smoother response, but it’s articulate all the same. Again, the Iris performs marvellously for its price. The stage it posits is stable, coherent and sufficiently out-of-head. The tone is lightly warm again, but the image is kept impressively clean at the same time. I think it’s a promising all-rounder that’ll resonate with a lot of people, especially those who enjoy calmer top-ends and upper-mids. With Orla and Iris, I see Rhapsodio as a dark horse in the entry-level. I hope for nothing but success, and I can’t wait to see where the company goes from here. Sat on literally the same table as Rhapsodio’s stable were Singapore’s very own Nocturnal Audio. 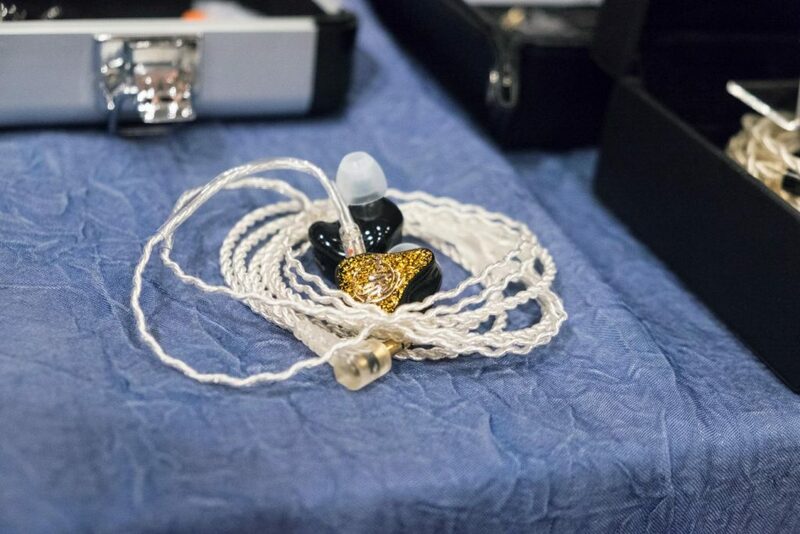 I recently took a look at their 3-driver Avalon custom IEMs, and they debuted their new 5-driver flagship at the show. Ironically, given their booth next to Rhapsodio’s, it was also called Eden. 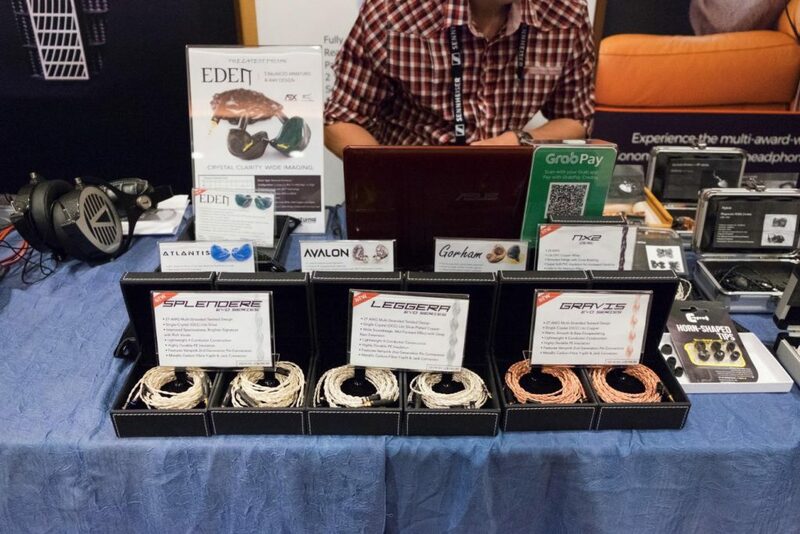 Alongside Eden were an entirely new line of cables called the EVO Series. Unfortunately, I didn’t have time to try out those cables, but I did give the Eden a long, thorough and surprising listen. 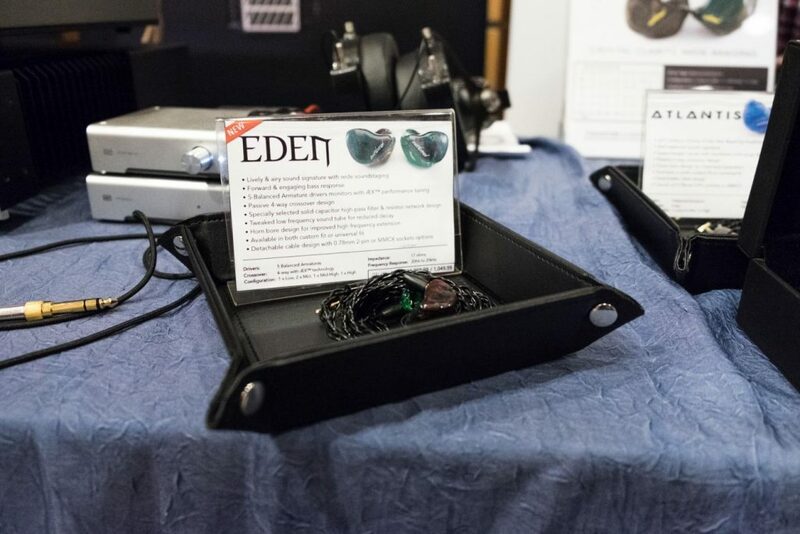 Nocturnal Audio Eden: The Eden is a musical all-rounder with strengths – surprisingly – in midrange linearity and tonal balance. Given the Avalon’s brave v-shape, I did not expect something so elegantly balanced. In timbre too, the Eden succeeds in bringing a wet emotionality that I felt the Avalon lacked. That upper-bass/lower-mid content that I’d been craving has finally arrived. Treble is much more refined as well. It isn’t as sharply-edged, but it’s articulate all the same. The low-end is similar in positioning to the Avalon, but what’s improved is body, fullness and warmth. It isn’t perhaps as resolving and physical as some of the dD-driven IEMs I’ve heard. But, for the price it’s targeting, there’s a naturalness that many of its peers seem to neglect. Imaging and stage stability are strong as well. Obviously, you’ll get neither the clarity nor the crispness of the Avalon, but I believe the Eden is the more sophisticated, mature and balanced of the two. With the Avalon, there was a concern in me that Nocturnal Audio was going to steer a certain way house-sound-wise, but I’m so, so glad to be proven wrong. The Eden is one of the most well-balanced, sophisticated all-rounders I’ve heard at this price. It reminds me of hearing the FlipEars AXIS in Japan last year. I think I’ve found another hidden gem yet. Throughout the many familiar faces I had the pleasure of seeing, very few brought joy to me more than reuniting with Kumitate Lab’s Ito-san. In an odd way, he was the co-progenitor of An Inner View – one of my proudest achievements throughout my THL authorship. And, it was a pleasure catching up with what he and Sasaki-san had been working on prior to his Singapore trip. On display were also his signature Raden designs, which I’m still kicking myself for not taking photos of. 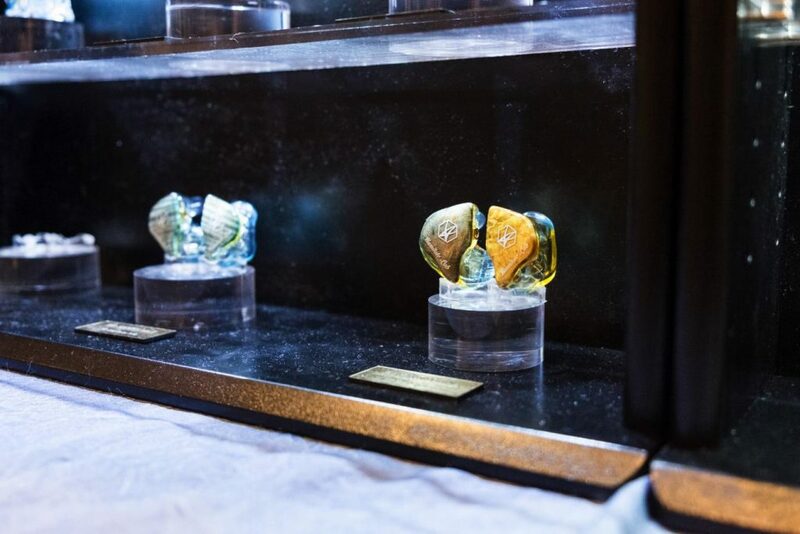 You can view those masterpieces close-up in the images he put up on social media here. But, I did get to demo his KL-Proto Ver. 2.0, utilising 3 armatures and a 14mm FOSTEX DD, as part of the FOSTER Alliance Program. Kumitate Lab KL-Proto Ver. 2.0: The KL-Proto possesses a likeable, mainstream signature with an even, versatile tonal balance. But, unlike their previous offerings, the Proto’s top-end is on the smoother side. Nevertheless, articulation and clarity both impress. Definition may not rival the Focus’, for example. But, I’m sure there are many who’d prefer this smoothness over raw clarity. Spatial performance is stellar as usual. The stage is clean, well-organised and possesses some of the best stereo separation I’ve ever heard. Though, stage height is rather average to my ears. Regardless, the refined top-end also allows those notes to musically cohere together to create a slightly euphonic, coherent response. The Proto’s laid-back upper-mids also tilts it towards a calmer, less boisterous and more spaciously-engaging signature. The Proto’s 14mm dynamic driver provides a unique bass response. Rather than thumps that concentrate in the middle of the stage, the low-end seemingly occupies the outermost regions of the stage. It’s as if waves of bass surround the perimeter of the soundstage, and it’s mid-bass-biased too with a more reserved sub-bass. As a result, the low-end comes across airy and pillow-y, rather than thump-y or concentrated. So, pure bassheads may not find the visceral impact they’re looking for. But, this tuning greatly benefits stage cleanliness and instrument separation too. Regardless, the low-end is undoubtedly dynamic in nature. It’s physical, vast-sounding and realistic in terms of decay. The mid- and sub-bass split could’ve perhaps been more even for a more solid, guttural timbre, but that comes down to preference. Ito-san incorporated Kumitate Lab’s Scene Control bass-tuning system into the Proto, and the impressions above were made with the low-end set to minimum. With the bass dial set to 50%, you definitely hear more low-end presence. But again, that presence is more peripheral than it is full or direct. Bass hits possess massive surface area, but the trade-off then is in density. This presence infuses an organic warmth which further coheres the stage and adds to the Proto’s euphony. And, the low-end is a hair darker in tone, but less effortlessly integrated into the overall frequency response. At full blast – a setting Ito-san does not recommend – the low-end has a thick, meaty presence which finally penetrates the centre of the soundscape. It’s almost bloated at this point. But again, the mid-bass-bias gives the bass a less solid, concentrated structure, so it might still not be to bassheads’ liking. Again, this is a setting that’s not recommended.